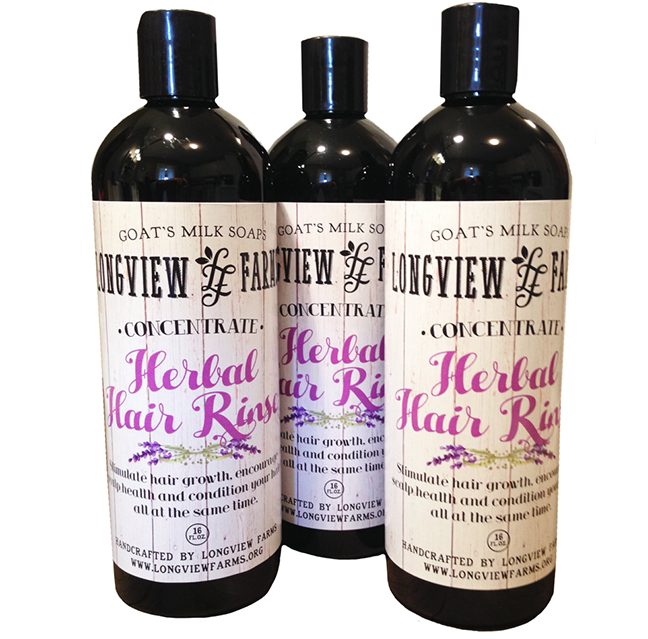 Promote hair growth, encourage scalp health & condition your hair all at the same time with our Herbal Hair Rinse! Our raw unfiltered apple cider vinegar is the catalyst for a host of stimulating herbs, sending your hair on it’s way to renewal and health. 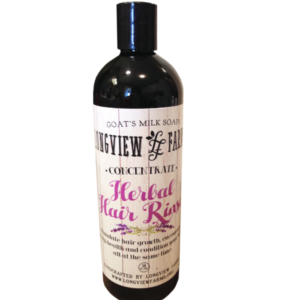 Our 16 ounce Herbal Hair Rinse concentrate will give you 16 conditioning treatments. 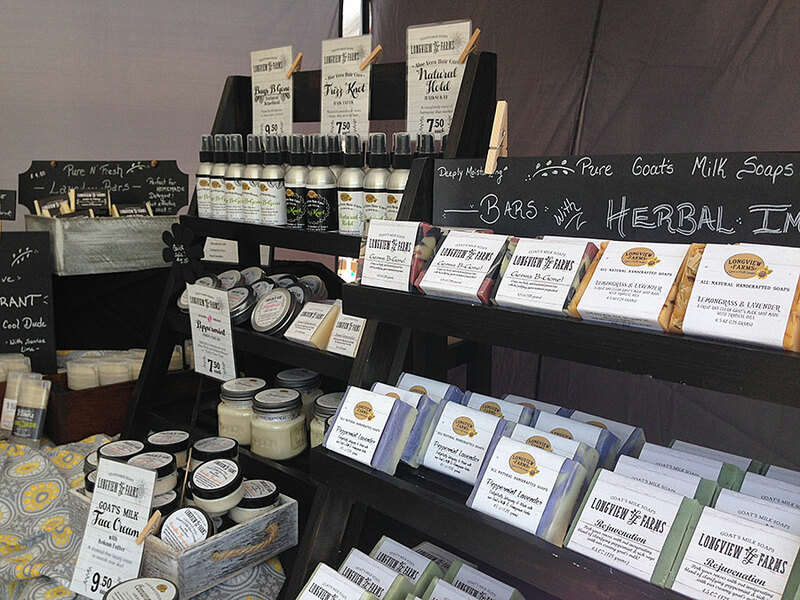 Directions: After shampooing with one of Longview Farm’s natural shampoo bars, pour 1-2 tbs. Herbal Hair Rinse in a quart of cool water. Slowly pour over head while massaging scalp. Let set for 5 minutes. Rinse out completely. Tip: For thicker and/or drier hair use a greater amount of the concentrate. For thinner and/or oily hair use a smaller amount of the concentrate. Ingredients: organic apple cider vinegar, chamomile leaf and flower, parsley leaf, linden flower and leaf, nettle leaf, horsetail, rosemary, sage leaf herb, Essential oils of grapefruit and lavender. Unfiltered Raw Apple Cider Vinegar (ACV) is an excellent natural hair treatment. It is cleansing, gives the hair more body and luster and can reduce hair-loss. Washing your hair with ACV reduces itchy scalp and dandruff by destroying the bacteria and fungi that clog hair follicles. Apple cider vinegar rinse can also add shine to your hair and prevent split ends. Chamomile Leaf & Flower is a great conditioner for damaged and dry hair. When used as a rinse after shampooing, it will help restore shine and bring out the natural highlights for blondes. It also helps to strengthen the hair to prevent breakage, tangling and split ends. Parsley acts as a hair tonic for thin hair and dandruff prone hair. Linden Flower promotes healthy hair growth, and strengthens dry and brittle hair. It is great if you’re dealing with damaged hair as a result of over-dying or dying the hair too often. Linden flower is even known to aid in severely damaged or overly brittle hair. It also promotes circulation in the scalp and will help new hair grow in healthier. Nettles herb is a rich source of Vitamin A and C. It is effective against hair loss as it inhibits the production enzyme which is the root cause of hair loss. Horsetail herb is effective for curing problems of oily hair. It is a rich source of silica. It makes your hair strong, sleek, shiny and manageable. It also stimulates hair growth as it enhances scalp circulation. Rosemary is one of the effective hair enhancers. This herb nourishes your flaky and dry scalp, hence solving your dandruff problem. It slows down premature graying and hair loss. Sage is an important herb for proper hair care. This herb is effective in treating scalp infection, dandruff and oily hair problems. It is said to lessen hair loss and restores the natural hair color.